I’ve been getting a lot of requests for comment on some proposed legislation by an Illinois state representative from Naperville to have a feasibility study performed on whether another Illinois public university can be added to the Big Ten. Here is the full text of the proposed bill. Note that I actually live in Naperville, but the applicable representative (Michael Connelly) doesn’t represent the portion of town that I live in. Most people that have a passing understanding of conference realignment know that the odds of the feasibility of the Big Ten expanding with any school from the state of Illinois is less than zero (but we’ll spell it out here for any first time readers that haven’t been paying attention to this issue for the past several years). First of all, what the Illinois State Legislature wants is completely irrelevant to Big Ten expansion. They might have some control over the University of Illinois specifically, but Michigan, Ohio State, Wisconsin and every other Big Ten school (even Northwestern) would laugh off any attempt for some type of legislative intervention. Second, a viable Big Ten candidate needs a combination of FBS football credentials, academic prowess (preferably membership in the Association of American Universities, which is an extremely select group of top tier research institutions) and, most importantly of all, additional media value in the form of new TV markets and/or a national brand name (i.e. Notre Dame). Considering that the entire state of Illinois is already receiving the Big Ten Network at the maximum cable carriage rate, any additional school from the state would add exactly $0 in TV revenue for the conference. That would actually mean that all other Big Ten universities would lose money with an Illinois-based expansion by splitting the pie further without making the overall pie larger… and the Big Ten isn’t making moves in order to lose money. Plus, the only other public university that even plays FBS football is Northern Illinois, who isn’t anywhere near AAU status on the academic front (and realistically never will be with its mission). If the State of Illinois wants to spend a single dime on whether it’s feasible for another public university here to join the Big Ten, then the legislature is flushing money down the toilet that it doesn’t have. That being said, let’s not throw the proverbial baby out with the bathwater on what ought to be the real intent of this legislation: creating a stronger #2 public university in the State of Illinois behind the University of Illinois at Urbana-Champaign (abbreviated as UIUC for ease of discussion here, although I’ve always thought that was a clumsy abbreviation as an Illinois grad) regardless of any Big Ten prospects (which are non-existent in reality). What I hope is that my fellow Naperville native can’t possibly be this naive and is just using the Big Ten name as a headline grabber in order to shine the light on the very real problem that the academic quality gap between UIUC and the rest of the state’s public universities is so large that Illinois high school grads are heading to out-of-state colleges at a rate that dwarfs almost every other state in the country. In the typical competitive Chicago suburban high school, the top 5% of the class or so is generally gunning for the Ivy League and Ivy-caliber schools (i.e. Stanford, Duke, Northwestern, etc.). The next 5% is the group that UIUC generally targets (with a little bit of variation depending upon the program – engineering and business require top 5% credentials these days, whereas an applicant might be able to get by with being in the top 15% for liberal arts). Regardless, an Illinois high school grad is pretty well-covered if he or she is in the top 10% of his/her high school class and the 90th percentile in SAT or ACT scores. The problem is the massive academic reputation gap between UIUC and the rest of the in-state schools. For the very large group of kids that rank between the top 10% and top 30% of their class (people that still have good-but-not-elite grades and test scores and make up a huge share of the college student population), UIUC is getting too tough to get into while the rest of the in-state schools are way too easy to get into in relation to their credentials. There’s no compelling option in-between that’s a solid fit for that group of students. In the latest US News rankings for undergraduate programs at national universities, UIUC is ranked #41 in the nation, but then there isn’t another Illinois public school until the University of Illinois at Chicago (UIC) at #128. Farther down the list are Illinois State (#152), Northern Illinois (#177) and Southern Illinois (#177). It just so happens that neighboring schools like Indiana, Purdue, Iowa and Missouri are in the top 100 of the US News rankings and have admissions standards that perfectly align to those top 10%-30% students that can’t get into UIUC, so Illinois kids go to those schools in massive numbers* and are willing to pay out-of-state tuition for them (which is still relatively less expensive compared to a lot of lower-ranked private university options). According to the Chicago Tribune, there was an outflow of 30,000 freshmen students from Illinois to out-of-state schools and an inflow of 17,000 last year, which is a negative outflow of 13,000. ** The academic quality gap is exactly why this is occurring. UIC is probably the only public school in Illinois that has a realistic chance of filling that gap since its faculty quality is already on the higher end compared to its admissions standards, the school is solid in STEM areas since it houses the University of Illinois system’s medical and pharmacy schools, and has what is now considered to be a very desirable location in the West Loop neighborhood of Chicago. (UIC was actually a visiting member of the Committee on Institutional Cooperation (CIC) that’s considered to be the academic arm of the Big Ten for nearly 30 years, but that status was revoked following the conference’s admission of Nebraska.) The main issue is that UIC’s reputation in professional circles (outside of medicine and pharmacy) actually lags behind its perception in academia, and changes there seem to be glacial. Every Big Ten school has a stronger professional network in Chicago in the finance and tech areas that fuel the influx of new college grads every year in Lincoln Park and Lakeview, and UIC still has to catch up to regional private Catholic schools like Loyola, DePaul and Marquette on that front, too. 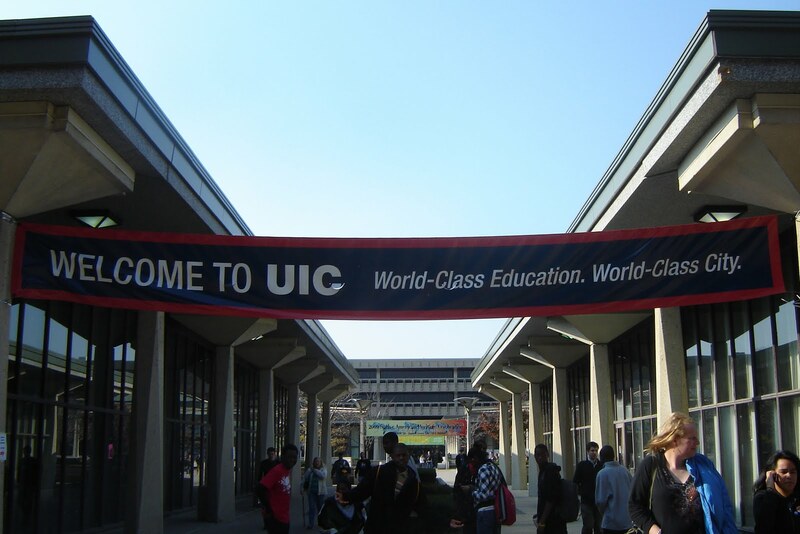 This is a self-fulfilling prophecy – UIC won’t move up in professional prestige without attracting better students, but such better students won’t go there until UIC moves up in professional prestige. The other practical problem is that it would take a ton of investment from the state to get UIC up to the level of schools that are strong non-flagships (i.e. Michigan State, Purdue, Miami University of Ohio, etc. ), yet the state keeps reducing the money to public universities every single year (and as noted, the state doesn’t have the money to give it to them even if they wanted to). Regardless, I hope that some type of better realistic in-state option exists by the time my 4-year old twins are ready to go to college in 13 years. If Representative Connelly can ensure that the focus is on that particular academic goal (as opposed to Big Ten membership specifically, which is a waste of time and resources because it will never happen), then I’m game. As many of my regular readers know, I’m a huge fan of both the NBA and college basketball. While this blog has generally focused on college football over the past few years since that has been the driving force behind conference realignment, I’m still a hoops guy at heart. As a result, I’m constantly thinking about how to balance all of the interests of the NBA, colleges and individual players while maintaining a high quality on-the-court product at all levels of the game. However, while I generally sympathize with Mark Cuban and the basketball fan masses on a lot of issues, this is one area where I believe a lot of people are having collective amnesia of what both the NBA and college basketball looked like in the early-2000s before the NBA age limit was put into place. Simply put, basketball at both the pro and college levels sucked back then. The NBA was drafting high schoolers such as Kwame Brown in the lottery based on raw athleticism that were thrown into the league prior to being ready, which created a sloppier and less polished on-the-court product. Meanwhile, the college ranks were depleted of a critical mass of top-level players in a way that ended up pushing down the quality of the play across-the-board. Even if the one-and-done year gets transferred to the D-League as Cuban proposes, this can have a disastrous effect on both the pros and college levels. This issue is a tough one for me because I’m someone that normally believes that if you’re good enough to perform a job or task, you should be allowed to do so regardless of your age. Yet, basketball seems to be the one area the laissez faire approach has proven to not work because of the nature of the sport. The main problem is that virtually everyone involved in the NBA Draft process needs to be protected from themselves (as the system provides incentives for everyone to take actions that are detrimental to the quality of the game overall). If I had faith that the only high schoolers that NBA general managers would draft were like LeBron James that were ready immediately at age 18 and, at the same time, only high schoolers that were of a LeBron-quality entered the draft into the first place, then it would be easy to say that anyone should be able to go to the pros immediately. However, we have empirical proof from the early-2000s that this simply doesn’t happen. Basketball, unlike football and baseball, is a game where obtaining an individual star matters more than anything. In contrast, stars in football and baseball might be important, but depth generally trumps stardom. As a result, NBA GMs were (and still are) significantly more mortified about missing out on the next Kobe Bryant or Kevin Garnett compared to their football and baseball counterparts (and it makes sense considering the type of superstar that you need in order to viably compete for the NBA championship) and they overvalued raw athleticism in high schoolers back in the early-2000s. Meanwhile, top high school players saw all of their AAU buddies getting massive paydays at age 18, so anyone with a prayer of getting into the draft jumped in (whether it was by their own volition or pressure from family members and/or street agents looking for a financial meal ticket). This created a vicious cycle where NBA GMs were taking unproven high school players based on raw athleticism with lottery picks that were previously used on seasoned college players (many of which were already household names by the time they entered the draft), such lottery picks were getting stuck on the bench with high bust rates as opposed to contributing right away, and college programs were left with the scraps. Blowing a top 5 pick in the NFL or Major League Baseball is not a good thing for a GM, but it’s at least recoverable or mitigated if the team has the right depth. In the NBA, though, blowing a top 5 pick can mean that your franchise is set back for a decade… and we saw a whole lot of NBA franchises blow their top 5 picks in the early-2000s. The current one-and-done system, while imperfect, at least provides a checkpoint for all parties involved: NBA GMs can watch players compete against people other than 5′ 11″ power forwards in high school (like I was back in the day) in pressure situations, while the players themselves get a reality check of where their skills really stand. Unfortunately, shifting the one-and-done year to the D-League in the manner that Cuban suggests would likely bring up the same problems as the old open NBA Draft without an age limit. NBA franchises would go back to drafting raw prospects (now for the D-League) as opposed to obtaining the best players that are ready for the NBA immediately, while top high school players will get delusions of grandeur and/or chase after the easy paycheck. Minor league basketball has had a bit more traction — the Continental Basketball Association survived for decades as an NBA minor league before finally folding in 2009 — but it doesn’t come close to outdrawing big-time college basketball. Go to any NBA D-League game, and you’ll be lucky to find a few thousand fans in the stands. More importantly, you won’t find the top high school prospects at those games. Jabari Parker gets more attention playing for Duke than he would playing for, say, the Fort Wayne Mad Ants. This is where we begin to understand the status quo. What we have here is an issue of branding. Minor league football and basketball have no traction in America, because fans have declared their loyalty to the brands of college football and basketball teams. College football, in particular, has a century’s worth of rich history in America. College students attach themselves to their schools’ teams, remain attached through adulthood, and spread those attachments to children and other family members. You can’t sell the Omaha Nighthawks to an army of die-hard Cornhuskers fans. They’ve spent decades engrossed in the University of Nebraska’s football team and all of its traditions. Supporting a group of guys trying to play their way into the NFL is not enough. These people demand Nebraska football. The point about Jabari Parker getting more attention playing for Duke than the Fort Wayne Mad Ants is particularly exacerbated in the NBA context even compared to the NFL because it relates back to the star system that’s inherent in pro basketball specifically. While Jabari Parker might get more specific basketball-focused training, avoids having to go to class, and even would earn a paycheck in the D-League, the exposure that he gets with nationally-televised games of Duke and constant SportsCenter highlights aids his own personal brand off-the-court and the long-term financial effects of that could vastly outweigh a year’s worth of earnings in the D-League. In turn, the NBA itself benefits from this as it gets to leverage the pre-made stardom of players like Jabari by the time they enter the draft, which creates further interest in the league. That aspect was completely lacking in the early-2000s (with the exception of LeBron, who legitimately was a household name by the time he graduated from high school) and we’d go back to that malaise if top players enter the D-League and Europe instead of going to college. The NBA has a golden goose here that it ought to be extremely wary of messing with again. So, that’s why I support raising the NBA age limit to 20-years old. It’s long enough for the NBA to get a solid evaluation of players and colleges to obtain the benefit of having top players on campus, yet short enough for the legitimately elite players to get into in the NBA relatively early. The next step is to get both the NBA and NCAA on the same page on this matter, which is probably the most difficult piece of all in this entire discussion.